American Workers Face Physical And Emotional Stress : Shots - Health News America's workers are subject to more physical harm and emotional stress than you might think, but many of these challenges can be mitigated by a good boss and good friends. A quarter of Americans say they don't have enough time at work to do their jobs, and about half of them bring work home. 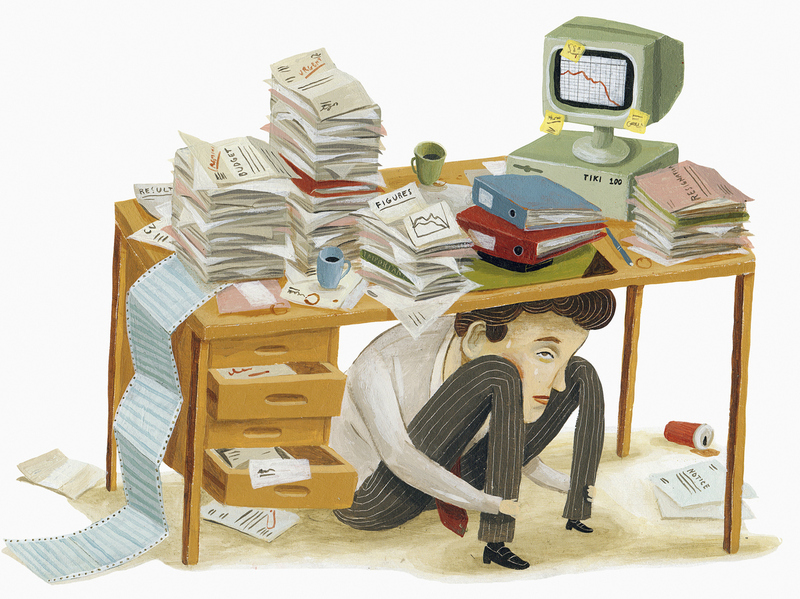 If you think your job is more stressful than it should be, you're not alone. Americans work hard, and it takes a physical and mental toll, not to mention that it frequently cuts into personal time, according to a comprehensive survey on working conditions the nonpartisan RAND Corporation published Monday. But having a good boss and good friends on the job can make work feel less taxing. In 2015, RAND researchers, along with Harvard Medical School and the University of California, Los Angeles, began collecting data from over 3,000 people from all income and education levels who work or have worked in all types of jobs. What they discovered about how we work may help inform policymakers looking to grow the economy and employers looking to retain the best workers. This kind of data, examining workplace conditions in the U.S., has not been collected for decades. "We have excellent data on wages, on training ... but we don't know much about the conditions of work," says Nicole Maestas, an economist and associate health care policy professor at Harvard Medical School who is the lead researcher on this study. What the researchers found was that more than 1 in 4 Americans surveyed say they don't have enough time to do their jobs, with about half of Americans reporting that they do some work in their free time. This was most prevalent among white-collar workers. Two-thirds of all workers say they frequently work under tight deadlines or at high speed. In addition, 1 in 5 reported experiencing verbal abuse, threats, humiliating behavior or unwanted sexual attention at work in the past month; or they experienced bullying, harassment or sexual harassment in the past year. "One thing that really struck me was the high prevalence of hostile social interactions at work," says Maestas. Her survey found that while such interactions were seen across the board, verbal abuse was much more common in customer service jobs and experienced at the highest rates among men who did not graduate from college. Younger women and women of "prime age," defined in the survey as ages 35-49, experienced the most unwanted sexual attention. But people who have "good" bosses — or bosses who respect them, praise them, work with them and give feedback — were less likely to have workers who reported verbal or physical threats, Maestra notes. "Maybe bad bosses are part of the problem," she says, when it comes to a hostile work environment. American workers feel, by and large, that they have a reasonable amount of autonomy on the job and are confident in their skills. Still, many workers, particularly those in service jobs and without a college degree, have little control over their work schedules. Some experience schedule changes the day of work or the day before. New York and San Francisco have passed laws requiring employers to make schedules more predictable, and Oregon may become the first state to require at least a week's notice of duty hours for certain service jobs so employees can plan doctors' appointments and child care and get to their second jobs. Despite multiple studies showing the benefits of telecommuting, it is still a rare option for many workers. The RAND survey found that 78 percent of employees are required to show up at their workplaces during regular business hours. No matter where we work, friendships play an important role in how we perceive our jobs. Sixty-one percent of women agree with the statement "I have very good friends at work," while 53 percent of men agreed. While the emotional support helps, many jobs are simply tough on the body. Seventy-five percent of people surveyed report intense or repetitive physical exertion on the job at least 25 percent of the time. While workers who don't have a college education report greater physical challenges on the job — think health care aides and construction workers — college-educated and older workers face significant physical challenges as well, particularly in the medical and sales fields where they are lifting heavy items and on their feet most of the day. The physical exertion of their jobs may be why some older Americans retire early. It's also a prime consideration for many seniors who say they would consider going back to work for the "right" job, Maestas says. "We've got more people retiring than ever, and there just aren't enough younger workers to both release retirees and grow the economy," she says, so employers should take notice of workplace conditions if they want to retain older, experienced workers. Additionally, 55 percent of workers report they are exposed to physical risks like smoke, fumes, infectious materials, extreme temperatures and vibrations from hand tools about 25 percent of the time. "That was strikingly high," Maestas says. Saba Waheed, the research director at UCLA's Labor Center who was not involved in the study, says she was also surprised by the extent of the health and safety challenges revealed in the survey. "We have a lot of great laws, but we need better enforcement," she says. While she largely praises the survey's comprehensiveness, Waheed says she would have like to see how workers fared along hourly versus non-hourly lines, as well as the experiences reported by part-time versus full-time workers. "I would really love to see race in here," she says, as well. Maestas says that the survey did not break down workers by race because doing so would have resulted in numbers too small to be statistically significant. The American Working Conditions Survey is based on a European workplace survey conducted every five years. Maestas and her team plan to compare the U.S. data with European data in 2018. The survey was funded by the Alfred P. Sloan Foundation and the Social Security Administration.